Perth Concert Hall will be serving a vegetarian-only menu on Wednesday when the English singer plays there. 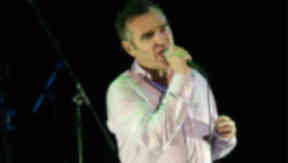 Smiths frontman Morrissey’s vegetarianism has caused a Scots venue to take meat off the menu on the night he performs. The often controversial Morrissey is playing at a sell-out gig at the Perth Concert Hall on Wednesday night as part of a UK tour. In 2009 the 52-year-old singer stormed off the stage at the Coachella festival in America after claiming he could smell burning flesh. The animal rights activist has backed vegetarianism through his music, with The Smiths song Meat is Murder being adopted as an unofficial anthem for the movement in the 1980s. Ben Jeffries, director of marketing and communications for hall owners Horsecross Arts, said: "Morrissey has a life-long commitment to animal rights and vegetarianism so understandably does not like the smell of cooking meat when preparing for or indeed performing a gig. “We are delighted to be welcoming this fantastic artist to Perth and, as with all our artists, Horsecross will do the best we can to make him feel right at home and comfortable here in Perth Concert Hall." In August this year the Lokerse Feesten in Belgium will order stalls to sell vegetarian food only when headline act Morrissey plays.